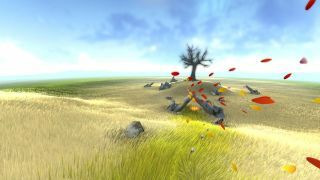 The arthouse nature game from 2009 came to PC at last in 2019. It may not seem like it but Flower is a game about explosions. I'm a gust of wind that picks a single petal from a flower then whooshes off with it. The petal flicks around, a toy in a puppy's mouth, as I zoom downhill, parting the grass like a meadow Moses. When I hit more clusters of flowers they spring to life and add new petals to my swirl. Color spreads through the nearby plants, glowing with life and vibrancy. It's an explosion, just a peaceful explosion of growth and natural beauty instead of propellant. Shockwaves emit from a central point, and stones tilt away as the force washes over them. It may not be a fireball, but I think Mr. Torgue would be proud all the same. Flower is the kind of arty indie game that could easily have been hippy-dippy goop. It isn't, and one of the things that saves it is being wordless. No italicized poetry appears in the sky, at no point does the voice of Mother Earth berate humanity for inventing roads. In fact, Flower incorporates man-made constructions in its later levels. Bleak skyscrapers are bad but it's fine with windmills, streetlights, and so on. It's not a game that wants you to tear up the pavement, but it would like you to appreciate parks and gardens. I finished it with a powerful urge to plant something. When I try to leave the meadow I slow down, then get buffeted back on track. While zhuzhing down a gully I miss some pink flowers and try to turn back, but am fought by the wind all the way except that I am also a wind? Unless I'm like an invisible petal wizard or something. You have to go with the flow or it'll fight you, but when you relax into it and let the shape of the landscape guide you, Flower coaxes you into a real state of relaxation and saying "ooh" every five minutes. You know how great the wind blowing through trees in The Witcher 3 is? It's that, but instead of playing as Geralt following tracks from a murder scene you are the wind rattling leaves around. Flower was originally released on PS3 in 2009, picked up a bunch of awards, and finally made it to PC 10 years later. It's available on Steam, GOG, and Epic.